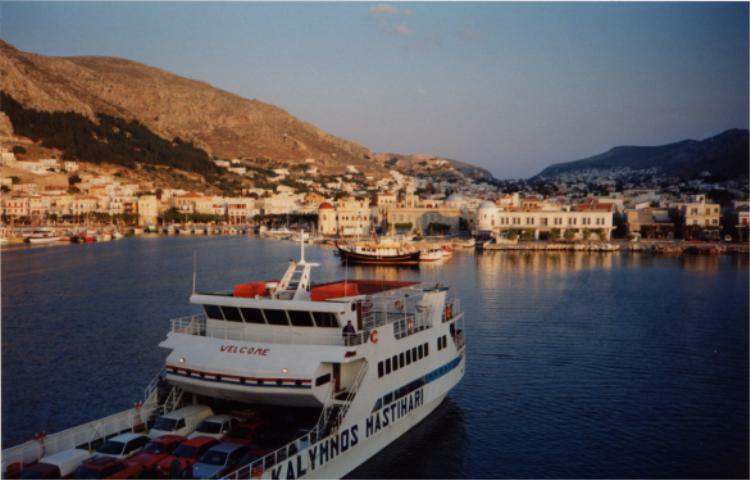 It was very early morning when I set off with a friend from Kos town to Mastichari to take the ferry to Kalymnos. We had planned to visit the island on a day basis and took our motorbike with us. 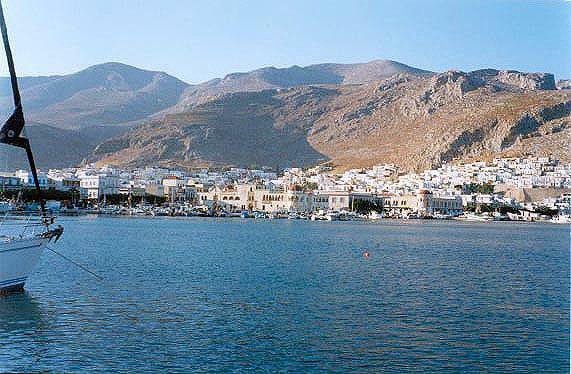 Kalymnos is a very small island and having the motorbike would make it easy to explore the whole island in a day. 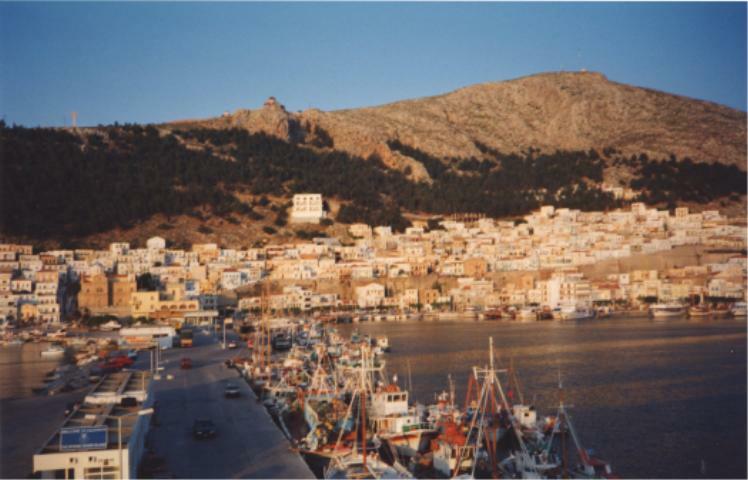 We arrived to Pothia, the port of Kalymnos the ferry journey having taken less than an hour. Pothia is a very beautiful town and has almost everything situated on the seaside. We had first to buy a map and then as we had made such an early start and missed breakfast we had breakfast at one of the seaside cafes. While we were there we made our plans for the day and then headed inland with me on the back of the bike reading the map. It seemed very confusing at first as there were a lot of one way streets and even the two way streets were very narrow but this was less problem with a motorbike. It was our intention to visit Embororious up on the northern tip of the island. On our way we stopped at the beach of Platis Yialos for a swim. It was not yet noon yet so very hot. Luckily the beaches on Kalymnos are many and the road closely follows the coast line. 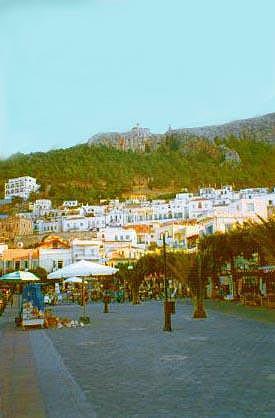 We continued to Emborios via Myrties and Massouri and called at the restaurant Artistico for soft drinks. We were not impressed by the village or its beach so we drove someway back the way we had come and stopped at the beautiful bay of Arginonda. It was a really hot afternoon and we spent some hours there. Hunger caused us to move on again and we drove to Myrties for a late lunch. Myrties and Massouri are very crowded with tourists and most of the islands big hotels are there. After lunch we headed towards Vathi on the other side of the island. 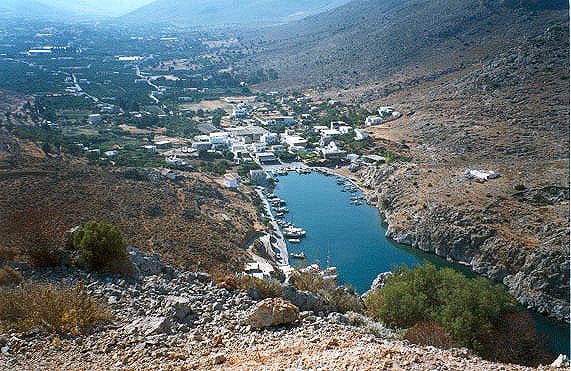 Vathi is known as the fjord of Kalymnos, a deep inlet of the Aegean leading into a lush valley with a number of beautiful traditional villages. The location for the village is outstanding and hidden from the sea. We drove on from there to Gefira or Therma (i.e. springs) but we didnt quite make it to the springs as it was getting dark by now and time to head for Pothia and the last ferry back to Kos. After such a hot day it seemed a freezing cold night especially on a motorbike and the ride back seemed so very long.